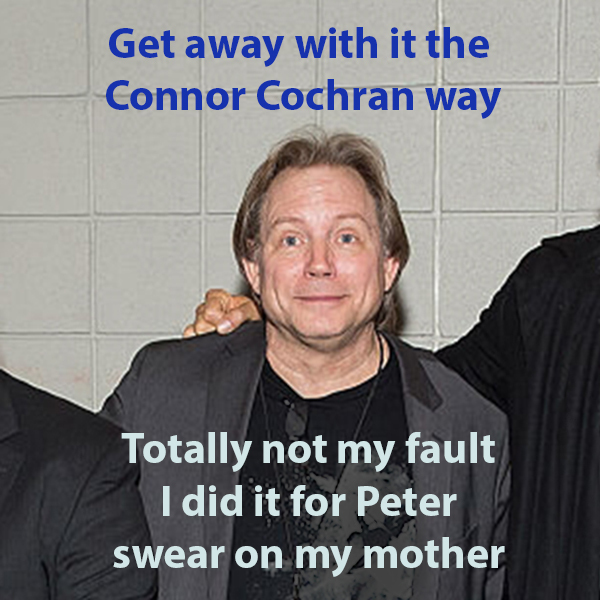 HomeConnor Cochran’s motive for defrauding and attacking Peter Beagle, explained by a reader. Connor Cochran’s motive for defrauding and attacking Peter Beagle, explained by a reader. Why – The short answer is $$$, and the long answer is about covering up. Cochran is desperate to deflect notice towards Peter’s supposed “health problems” – and away from his own history of predatory business scamming. Avicenna was the sham corporation formed in 2008 by Cochran (with his disgraced ex lawyer friend.) It was supposedly made for Peter Beagle to share ownership 50/50. The other 50% was Cochran’s, with Conlan Press doing all the public business (and cheating so many fans). He promised to bring in multiple authors, but Beagle’s work remains the entire source of value – and Cochran refuses to account for the money. 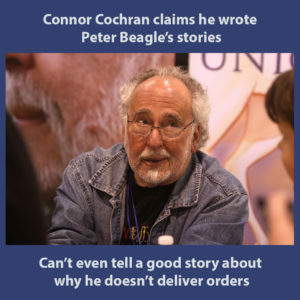 “Connor’s arguments about people preying on Peter – mostly directed at Peter’s girlfriend – all circle back to his assertion of Peter’s lawsuit being the only reason the movie deal didn’t work out (and Connor is also blaming Peter’s withdrawal from having anything to do with Conlan/Avicenna as the reason other book projects have not yet gone to press. Conlan’s projects are FOREVER “…about to go to press.”) There’s NO OTHER WAY to show harm. And every time Connor has to argue about Peter’s mental capacity, he rolls out the same story about Peter demanding Connor give him his mother’s ashes, which Connor says he already had – whereas MANY people can counter Connor’s claims by relating examples of having perfectly lucid and lengthy conversations with Peter. Connor’s full time occupation is running Conlan Press… the money Peter’s work generated has been his own sole income. “If nothing else, if NOTHING else, Peter should be receiving money from the sales of the ebooks – which were launched en masse AFTER the lawsuit was filed – and the sales of the books that have happened since, plus a portion of the money from the screenings of the film – which continue without his involvement. But Connor/Conlan/Avicenna refuses to give any accounting, much less any payment , and Peter is having to rely on being paid by other editors and publishers who will work with him directly for new work . 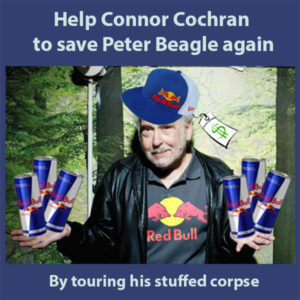 It’s only speculation to assume that the argument would be that Conlan and/or Avicenna owns the rights, and thus owes no accounting or payout to Peter under whatever contractual terms Connor talked him into – but as Conlan Press and Avicenna are built IN THEIR ENTIRETY on the work of Peter Beagle, then any money came to those entities FROM the work of Peter Beagle, so it’s easy to see who benefits most from maintaining the status quo. And as Connor’s full time occupation is running Conlan Press, if he is withholding anything from Peter because those entities control the rights, then he’s only been able to do so because of the money Peter’s work generated, which has been his own sole income. The kids’ position is also clear from a comment Kalisa made on one of those other stories, about how Peter signing 5000 apology notes was a part of his contract. They have clearly bought into Connor’s savior angle, and don’t see the thing Peter was signing apology notes for was another one of Connor’s failed schemes. Cochran was sued by his investors after making the comments – guess how likely it is to restart a deal. Cochran pretends he meant to make Peter “co-owner” of the movie. But his manipulative comments to this reader put it far into the future of an elderly man… and a decade wait for products he sold still hasn’t produced them. He denies there is benefit from false claims about Peter’s health – read it above. He claims a lawyer who knew Peter dismissed his claims, which indicates Richard Mooney. He served Cochran to take over the movie rights and now represents Cochran as a very self-interested crony in attacking Peter. Here and here are volunteer reports. 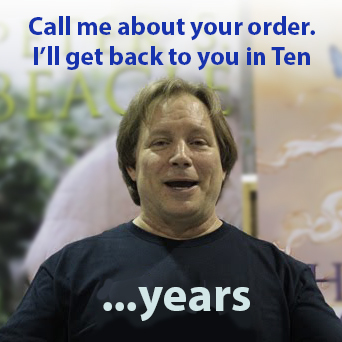 Products sold and not delivered since 2005 include audiobook CD’s and ‘Two Hearts”, “Extra Deluxe” Last Unicorn books, the “Writing Sarek” book never to be produced without Peter, movie tour edition books, and more that can’t be accounted for. Even before taking over Peter’s career, Cochran was soliciting sales for his own book that appears never made. Peter’s lawsuit is seeking recission of contracts because they were made with fraud and to deprive him of his rights. Cochran’s home; Peter’s apartment loss involved Cochran’s control of his lease. Slight correction – Cochran’s ebook launch was October 2015, shortly before a lawsuit but when he knew it was coming. Peter had hired a fiduciary in September to manage his finances; Cochran got a crisis manager. 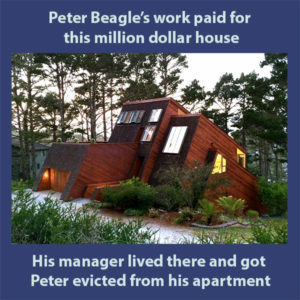 After lawsuit, sales promotion grew but Peter never received any money. 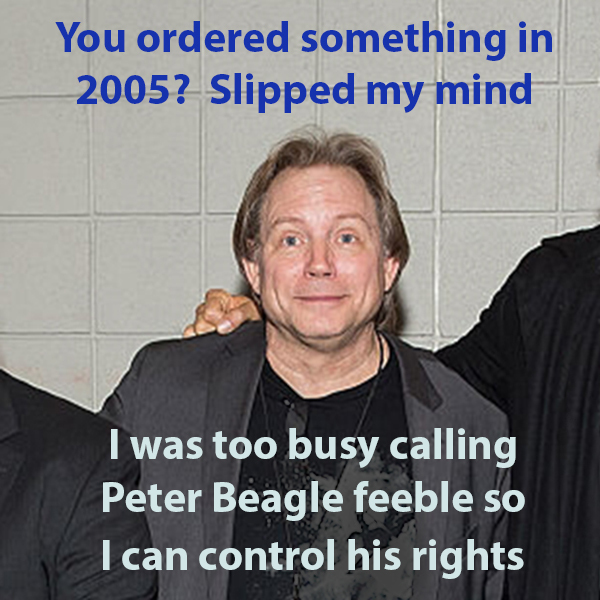 Denied pay he is owed, Peter is relying on honest publishers such as Tachyon. ← Full text of injunction to stop Connor Cochran from exploiting Peter Beagle and his work. About those apology notes: Even if it were part of his contract, and correct me if I’m wrong, I thought the issue was that he had been forced (or highly pressured) to sign all 5000 of them in one sitting, without breaks. ***No matter what a contract says, a worker is entitled to breaks and rest in the US. 1) This type of task was in his contract. So his recollection is different than the people trying to get conservatorship over him but that seems to be the whole problem and not really a surprise. No surprise at all, Lir. And I don’t understand why there couldn’t have been one typed apology note that simply said, “Dear Fan…” that Peter couldn’t have signed, and that they couldn’t have made 5000 copies of. YES, THAT. The personally signed postcards were some sort of apology to fans for cancelling a bunch of appearances, but whose idea was that? When Peter’s autograph is worth money, which is how they charge extra for signed books, why give it away just because the appearances were cancelled? Oh, where to start with the Jonestown vibe coming off of Kalisa’s comments about her father. Really, has anyone, ever, said such a thing about Peter before? Sure that wasn’t Connor? There isn’t a snowball’s chance in hell that isn’t straight from Connor’s lying lips. Coaching all of them. You know how to tell – It’s his indelible signature of projection and doublespeak. The sheer pointlessness of forcing a talented writer to robotically sign apologies with so much of his valuable time leaves no other conclusion. That’s just Misery-style punishment. So glad he stood up to it with a much needed lawsuit. I’m wondering who actually got the 5000 postcards, since the excuse for not delivering swag to tour volunteers is that the address information got misplaced or lost. So, are the postcards being handed out, or mailed, or what? Connor posted that four months ago but Peter was recently forced to move, and the financial person he hired said that she hasn’t seen any money from Connor since September, so no money was going to Peter from the sale of that ebook or any of the others and clearly no money was going to Peter’s landlord. So that’s the question: if after Peter started the lawsuit Connor still said sales of that book were going to the landlord payment but then Peter was forced to move, what is Connor’s reasoning for not paying?